I was giddy with excitement as I turned the pages of One Word from Sophia since I’ve been waiting for a book like this for what feels like years. 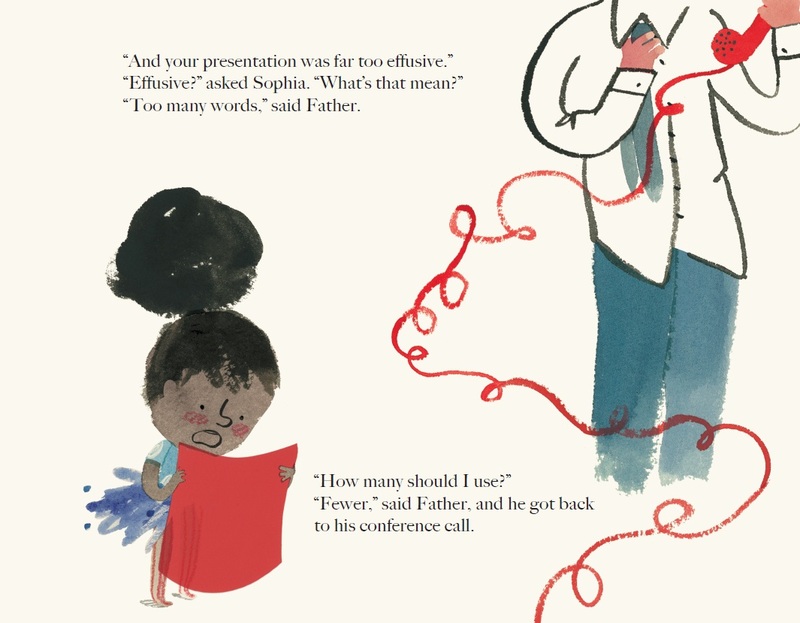 Jim Averbeck and Yasmeen Ismail‘s book is ideal to use when launching a persuasive writing unit of study since it is a fun way for children to think about what makes a compelling argument. Sophia stated her claim and provides a variety of reasons why she should receive a pet giraffe. Sophia used transition words and phrases, such as also and in short, to help piece together her evidence about why she should have a giraffe. Sophia organized her argument to group together related ideas (e.g., giraffes are good transportation than cars; her business plan about how much money she’d make by providing manure to garden centers). N.B. : The first presentation of her case to her mom included the most reasons or examples. Sophia’s mom felt her argument too verbose, which you might want to discuss with students. As a result, her arguments got shorter and shorter with every family member she approached in an effort to persuade them to get her a pet giraffe. When students write opinion pieces we want to make sure they’re providing readers with several sentences about each reason they’re giving so as to advance their claim. Sophia used a variety of evidence — facts, polls, and examples — to strengthen her argument. Sophia had a serious tone in an effort to persuade her family members to think her way. NOTE: Sophia is young girl who doesn’t have any counter-arguments. This makes sense seeing as this book is for 4-8 year-olds. That said, if you were to use this book with older students, you would want to make note of her lack of counter-arguments. 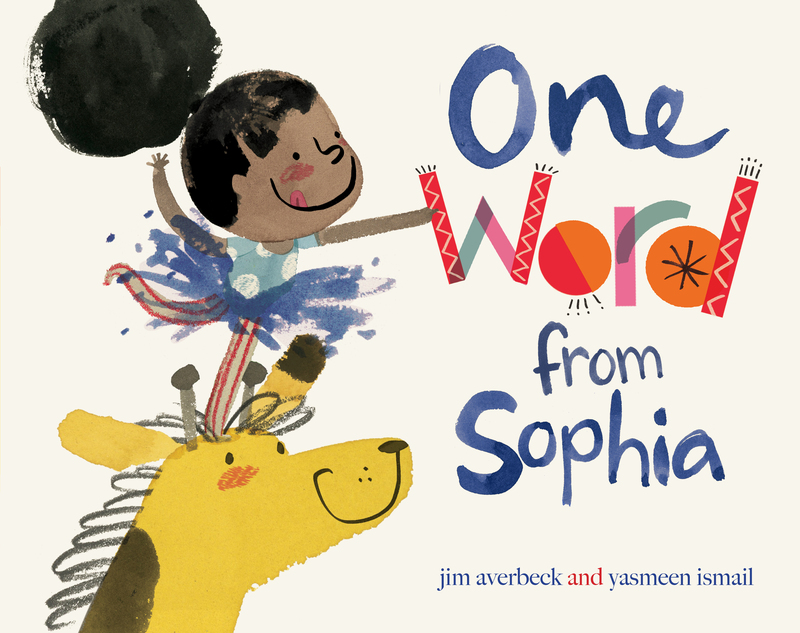 This giveaway is for a copy of One Word from Sophia by Jim Averbeck and Yasmeen Ismail. Many thanks to Atheneum Books for Young Readers for donating a copy for one reader (USA mailing addresses only). For a chance to win this copy of One Word from Sophia, please leave a comment about this book and/or persuasive writing by Friday, October 9th at 11:59 p.m. EDT. I’ll use a random number generator to pick the winner, whose name I will announce at the bottom of this post, by Monday, October 12th. If you are the winner of the book, I will email you with the subject line of TWO WRITING TEACHERS – ONE WORD FROM SOPHIA. Please respond to my e-mail with your mailing address within five days of receipt. Unfortunately, a new winner will be chosen if a response isn’t received within five days of the giveaway announcement. You are absolutely right…We need more mentor text to motivate students and give them models for writing! This books sounds absolutely great for this and I plan on getting a copy. I also appreciate you leaving some other title names because I am always looking for more…each week, they should have one to be a model for writing! Thanks for sharing! ← Who’s Up For a TWT Voxer Book Club? This sounds like a fantastic mentor text! I love that she goes into “slideshows, graphs, pie charts, statistics, and even a business plan”–hilarious! Love the line “pay me for poop”. I am excited this book models the use of multiple pieces of evidence to support an argument. Great mentor! Adding mentor texts to my persuasive writing unit is so exciting! I can’t wait to read this to my kiddos! I read a picture book every day in my MS writing classes, using the books as mentor texts for 6 trait writing, among other things. I use Arnie the Doughnut when teaching persuasive, and I would love another mentor text to add to the collection for that writing genre. Thank you! Can’t wait to share this book to the teachers I work with. Thanks so much for the information. This is a great new book to use for my persuasive unit! Thanks for the suggestion! I, too, struggle to find interesting and well-written mentor texts for opinion writing. Because there are so few “out there,” the same books seem to be used across grade levels. Something new is refreshing! Agreed! We need to use mentor texts and need more that spotlight persuasive arguments! Thanks for sharing this title! I love the way her father coaches Sophia on how to edit her argument as shown in the pages you shared! I have used I Wanna Iguana in the past, but it was never enough to help my students fully understand persuasive writing. I definitely want to check out this book! Thanks! It’s so hard to find good persuasive writing mentor texts. This looks like a fabulous addition to the collection in putting together. Thank you for sharing and for offering one of us a free copy. Can’t wait to check out the whole book!! I just facilitated a W. Workshop Class on opinion writing yesterday. This post was just in time for me to share this great mentor text and your blog with teachers. I am excited to use it as well. This looks like a fabulous book. Thanks for the recommendation. This book would be perfect in my classroom to teach persuasive writing! You are so right, Stacey! It IS hard to find good mentor texts for opinion writing for young students. So, I appreciate this post so much. Thanks for sharing the older titles you’ve used, as well as this new one. It sounds perfect. This would be a great book to have in my 3rd grade classroom. I have been looking for an idea of how to get the kids thinking more persuasively. What a great find, looks like a fun read!! I need this in my library! This would pair perfectly with I wanna iguana. My teachers would love this!! It’s always a struggle to find good persuasive mentor texts! I’d love to use this one in my classroom. What a delightful book! Like everyone else, I’m always looking for quality books for argument writing in any grade! Thanks for sharing with us! Perfect! I have a multi-grade class and would like to have a mentor text that doesn’t repeat either of those grades. Thanks! I ham about to intro an essay of argumentation to my high school students and I am tempted to use this instead of a dry sample essay. This is my first year using the workshop model for writing. I need all of the resources I can find! This sounds really cute and would make a great read aloud for persuasive writing. I was also excited to come across this book at my local bookstore because it is a great mentor text for opinion writing. Always on the lookout for great mentor texts to use with kids! Hi! I would love to use this book to work on opinion writing with my speech and language students. Thank you very much! Looking forward to checking out this book out and using some of the teaching points from this post. This is a great addition to mentors for opinion writing. What an exciting find. Thanks for sharing it! Great book! Great ideas! I use The Day the Crayons Quit and The Day the Crayons Came Home for opinion and letter writing mentor text, and One Word From Sophia will fit in beautifully with these great book. Thanks for sharing. We are just starting into writing. I love finding texts to help them see what writing is all about since our world is small at First Grade. Thanks!!! I am always looking for resources like this book to share with my teachers. I promote using literacy across the curriculum and can’t wait to add One Word from Sophia to our library! I can’t wait to get a copy of this book to introduce opinion writing to my 2nd graders. Mentor texts are a key part of teaching students about different styles of writing. Thank you for sharing this great mentor text. I look forward to using it with my second graders. I especially like the reasons people give for not being convinced. A great way to talk about how a peer editor can help a writer refine their argument. Thanks for sharing. I can’t wait to read this book and use it for our persuasive writing unit! The kids are going to love that poop is mentioned…they are eight and nine after all! The list of possible uses as a mentor text is also very helpful. Thank you so much for sharing! Thanks for sharing this mentor text. I can’t wait to check it out. I love giraffes too! I’d LOVE to win a copy!!! I’m a second grade teacher and would completely adore reading this but on top of that my daughter’s name is Sofia (with an F but that’s ok;)). Anyway, we buy books with strong characters in our daughters’ names. Yay for this book! I love this! Thank you for sharing. I will definitely check this book out. I am always looking for new books to use. Opinion writing can be difficult so this book would be great to use. This is awesome. Today we had a discussion at an inservice about persuasive writing in the elementary grades. I will be looking at this as a resource. Thanks! Thank you for sharing! I can’t wait to check out this book! I really appreciate your blog and all that you do! I am a recent subscriber to this feed and have found many helpful writing tips. Thank you for finding another mentor text that I can use with my second graders! Thank you for sharing this mentor text! I love when you feature great finds like this! I just changed from fourth grade to second grade so this kind of text is exactly what I’m looking for. Another suggestion for perhaps older students is A Pig Parade is a Terrible Idea, which I used as a mentor text for persuasive essays. Sophia is a strong female character, I need to teach my students persuasive writing, and I love the humour and illustrations! All great reasons to get this book. It s interesting that I recently had a conversation similar to Sophias with my high school senior who wants teacup pig for a pet! I think even at 17 she would have to admit to being entertained by this story. Picture books work really well with all my 6th grade ELA students. As mentioned in this post, be aware/be sure to point out that this book does not acknowledge the counter argument. Another helpful resource in teaching persuasive writing is using the Four-Square Argument chart (Kelly Gallagher, Write Like This, p. 177). Mr. Gallagher states the chart helps students “flush out all the sides of the issue” (Gallagher, 2011). I have used the chart with my students and it helped them to realize/acknowledge the issue from the opposing side and not just their side of the argument. Oh wow! This would be a delightful read aloud to use with both children and my teachers when planning together for our upcoming opinion writing units of study. Thank you for this book idea! My favorite mentor text for opinion/ persuasive writing is the book a pig parade is a terrible idea. It contains a counter argument as well as a good conclusion. I love this book for so many reasons!! Besides being such a great mentor text to work with persuasive writing, with the limited number of books with a beautiful, bright, girl of color this selection should be in everyone’s diverse library. I often use picture books in my high school classes both as mentor text and hooks for reluctant readers. As a social studies teacher, I use pictures so often to teach concepts, my students sometimes forget they aren’t in reading class. I think you make some fantastic points about Sophia’s use of transitions and slowly trimming down the length of her arguments. I hope the authors are working on a sequel! I am always grateful when people share new mentor text ideas! I love using picture books as mentor texts for all of my writing units and have needed to freshen up my persuasive collection. This seems perfect! Thank you for including the mention of the lack of counter-arguments! Fingers are crossed! It’s interesting to me that when I was in school, persuasive writing was saved for high school when we all know that children often have the most creative and often irrefutable arguments! I know I’ve been worn down by a child more than once. Persuading a parent for a pet is real life and hits close to home for many kids! What fun! Thanks for the mentor text suggestion. I am really hoping to get this! I share all these great ideas with fellow teachers and they really try them out. I am looking forward to using this as a mentor text this spring- as always TWT is great! This book sounds amazing! !! I use picture books with my high school students on a weekly basis. Can’t wait to use this one! I would LOVE to have this book as part of my mentor text collection! Thanks for the opportunity! I am always looking for new mentor texts! Looks like a wonderful book to read with my middle schoolers! This book has the same problem that most (all) children’s books have as mentor texts for persuasive writing (I Wanna Iguana, for example)–they’re not written in the “essay” form that is the expectation for persuasive texts that kids write in school. Personally, I would rather see kids write engaging narrative/persuasive texts rather than boring persuasive essays in the 5-paragraph format. Nevertheless, it’s a great example of reasons and examples that kids will find interesting and humorous, so it works in that sense. I can’t wait to use this book. It’s always a bonus when you have a student with the same name as the main character! I put it in my shopping cart already and will buy it if I don’t win it! So excited for another great mentor text!! I would LOVE a free copy!! I love your blog, thank you for sharing! Adorable illustrations! Argumentative writing with 6th grade can be challenging but once they start they usually love it. I’ve been looking for a great mentor text like this! I teach third grade so I too share your struggles of finding mentor texts. I would love to add this book to my read alouds! Can’t wait to use this as a mentor text during our persuasive writing unit! I appreciate all the suggestions on TWT and have incorporated many of them into my classroom. Yea!! I’ve been looking for a mentor text for persuasive writing too! Would love to use this with my 3rd graders. If I don’t snag a free copy, I’ll have to buy my own! I teach 2nd grade and I treasure my mentor texts! This one looks amazing! I use a picture book at least once a week in my middle school ELA classes. I’d love to try this out with them when starting argument writing next term. I can’t wait to read this book. It’s a new title to me. Thank you for the lesson ideas. I was just having a related conversation with a colleague about Units of Study. So many of the books are older. Thank you for bringing a new one into my repretoire. Thank you to you and Antheneum Books for sponsoring this giveaway. Kinda’ similar to this character’s dilemma. Would love to have the book! Thanks! I am a reading coach K-6 and I will share that title with my teachers! Id love to win this book! I love using mentor texts to teach writing. Thank you for not only the title of this book, but the concrete ideas to use as lessons in the class. Do you think it would be effective with middle school boys? I think it skews a little young for middle school. However, if you present it well (i.e., sell it to them) as a writing mentor, then I have a feeling they’ll embrace it. Thanks for sharing this title! It will be a perfect mentor text for our Kindergarten and 1st Grade teachers to use with their persuasive/opinion writing units. I’m wondering how many of our kids will guess the “one word” that Sophia uses!?! I would love to win a copy of this book to share with the teachers in my schools! I’m a K-5 literacy coach, and this book sounds perfect! Thanks for all of your timely posts. I share them out often! My second graders will love this! We’re in the middle of an opinion writing unit now, and Sophia seems like just the spark we need to re-energize! This would be a great gift to our school! Thanks for sharing. I have been gathering a list of persuasive mentor text. I’ll definitely include in my mentor library. Bank Street bookstore is a great place! Wish we had something like it in Honolulu. I’m in for the drawing. This book sounds perfect! I can’t wait to read it! Great post! I always had a hard time with a mentor text for this unit. Kids are so cagey in their methods, it’s a thing that they know well and can capture verbally without sounding whiney! I love the little prompts and the strong use of words in defense of the argument. Not just for 4-8 year olds, that’s for sure! Great template for all grades! Definitely can be used for upper elementary, Gael! Hurray for a fresh look at sharing opinions! So often we use the same mentor texts in our classrooms and by fifth grade, students are not so interested in those old familiar books. I can’t wait to have my own copy to share in the classroom! This looks like a great book to teach opinion writing to all grade levels. This sounds like s great mentor text to use for persuasive writing. Perfect for third grade! Thank you so much for sharing such a great resource! It is always nice to hear about new books! This sounds like a great book to use. I adore the main character and her determination! Picture Books ROCK for mentor texts! Thanks for the other recommendations too. Teaching writing to 4th-6th grade inner city kids!! I totally agree with you about persuasive mentor texts. It does seem as if everyone is using those same few you mentioned. I can’t wait to check this book out! Thank you for sharing the book. I know my students are going to love it. What a great book! From the few pages that you shared, Stacey, I’m especially excited about the layers that this book has to offer. From “reading” the illustrations to “how would YOU have presented your arguments?” make this book really accessible to lots of grade levels. And who wouldn’t want a giraffe for a pet?? I have struggled with the same situation–not enough mentor texts for persuasive writing! Thank you for the recommendation. I will definitely check it out! I’d love to see more persuasive picture books out there. At least there are a few good ones, like Sophia! Thank you so much for making us aware of a fabulous title to add to our mentor text libraries. Looking forward to reading the whole book and using with our kids. Thank you for sharing this book! I am always looking for mentor texts for the opinion unit of study and this one is exactly what we need. I am so excited to read the whole thing! Thank you for not only sharing a great mentor text but also providing pointers on how this text can support with using the text to help elicit from students the various characteristics of persuasive writing. I can’t wait to add this to the collection of books that I use with students as I get them to explore the persuasive writing genre and then get them to become authors and write their own persuasive pieces. Sounds like a fabulous book to support opinion writing. Thanks for sharing a new mentor text! I am always looking for books to add to my collection. Great book, would love a copy to share with my teachers! I, too, have not found as many persuasive mentor texts as I would like. This looks like a keeper. This looks like a great book. I appreciate you including the sample pages. Thanks for the post. I cannot wait to start using this book as I model lessons in classrooms. I, too, have fewer quality Opinion Writing mentor texts and this looks like a great addition to my collection! Thank you! In our kindergarten classes, we love “I Wanna Iguana” for our opinion mentor text. Sophia looks like another great fit for 5 and 6 year olds! Thanks for the opportunity to win, and for bringing this great book to my attention! Looks like a beautiful book and will inspire talk and writing among my primary aged students! Thanks for the sample pages. It gives a taste of how humorous the book is, also! Thanks for sharing! Can’t wait to use it with my third/fourth graders! Thank you for another wonderful opportunity to receive a book. And for another post that we can use, not only for this book, but as a mentor for thinking about other books. I am in love with, Sophia, and her strong personality. This is a wonderful mentor text to use for our upcoming persuasive unit! The format is truly comprehensible for a young writer. LOVE IT! I have been using The Day the Crayons Quit for the last few years. i am excited to try this one out as my new mentor text for opinion writing. I love using mentor texts during writing. I think One Word for Sophia would be a a great addition to my collection! Sounds like a GREAT mentor text!thanjs for sharing! My students have been begging for a class pet. My mind has been concocting a persuasive writing challenge. Looks like I have a go-to resource now! Thanks for sharing this text and ideas for using it as a mentor! love love learning about mentor texts that others have used!! I will teach a process writing course this spring to graduate students and as I love discovering new books to share, this sounds like the perfect addition to my collection. Thank you for introducing me to a must have mentor text!! This would be a great book to share with your grad students! That book looks precious! I too have been looking for additional persuasive mentors. Would love this text! Always on the look out for great mentor texts! Hi Stacey – This looks great! Although we’ve been using The Day the Crayons Quit in 2nd grade and up, we’ve been struggling to find a mentor text which is appropriate for primary. The illustrations look amazing! Thanks for sharing this gem, and for continuing to be a “staple” resource in our writing classrooms. What a kind thing to say! It’s my pleasure, Laurie. The timing of this post is perfect! I start opinion writing in a few weeks, and have been thinking about which mentor texts I’ll be using. Thank you for your insights and fabulous blog. I read it regularly and appreciate how you highlight the realness of conducting Writer’s Workshop in the classroom. I’ve been sitting on this for over a month now. I didn’t want to blog about it in early September since I realize most people aren’t having their kids start the school year with argument writing. I’m glad it comes in handy now. And thank you, Kim, for your kind comments. The eight of us try our best to make sure we’re providing relevant content. I am always excited when I see a new mentor text review for writing. I have purchased several of your suggestions over the years and have had great success using them with my students. Who doesn’t love a great children’s book?? I’ll be sure to add this one to my Amazon shopping cart if I’m not lucky enough to win the giveaway 🙂 Fingers crossed! My favorite thing about teaching writing is the use of mentor text! I love being in the library or bookstore and exploring all the possibilities. This looks like a great one. Looks like a great book! Thank you for sharing Stacey! How exciting to find another mentor text to use in persuasive writing! Thanks so much for sharing! So happy you found a new text for opinion. Wish we could find more where it’s about something ‘larger’. Thanks for the opportunity to win this. It will be a great coaching book. This is becoming a favorite genre of mine to teach and I can’t wait to use this book as a mentor. It sounds perfect! What a fun way to illustrate the sophisticated components of a persuasive argument. Our students would enjoy it greatly! I like the support for opinions as well as use of transition words. Thank you for the recommendation! 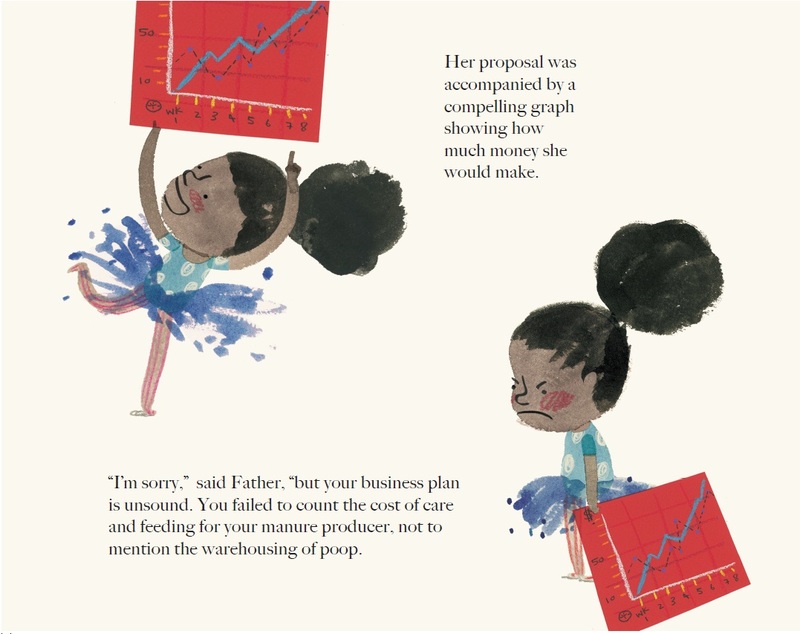 “In short, people will pay me for poop!” Who can argue with an young entrepreneur like Sophia? This book will engage readers of all ages….I am already wondering what she will do next! I wondered if I should share that, but then I thought “why not?” It’s hysterical (and brilliant). Glad you appreciated it! Awesome!! I love using picture books with each unit of study for my 7th and 8th graders, and always struggle to find one for persuasive. This looks fabulous!!!! !